You can sign up via this online form and also read the Constitution and Bylaws below. The club will be known as the Turning the Tide UVic Club. 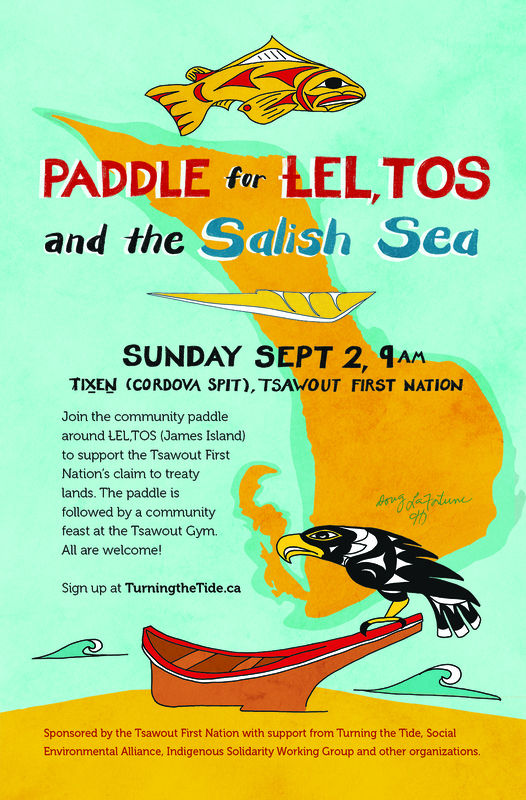 The purpose of the Turning the Tide UVic Club is to create a community of students and allies around a shared love for the Salish Sea and human-powered marine recreation, with fun and meaningful events building toward the annual Turning the Tide: Peoples’ Paddle for the Salish Sea. The Club will also participate in year-long advocacy with members of the campus community and broader public for ecological responsibility, social justice, strengthened connections between coastal communities, and the transition toward the post-carbon economy. Upon dissolution of the Turning the Tide UVic Club, any assets remaining after the satisfaction of debts and liabilities will be transferred to the University of Victoria Students’ Society. University of Victoria Students’ Society members will comprise at least two-thirds (2/3) of the membership of the Turning the Tide UVic Club. General Meetings will be held at least monthly from September to November and January to March to give the membership control of the direction and activities of the club. General Meetings are scheduled by the executive. Annual General Meetings must take place in the month of February each year. Semi-Annual General Meetings must take place in the month of October each year. Only club members are entitled to vote at General Meetings. Special General Meetings may be called any time between September and April by either the Executive or at the request of one-half (1/2) of the club’s membership. The Executive will prepare the agenda for General Meetings, based on input from the membership. General Meetings must be advertised at least fourteen (14) days prior to the date of the meeting. Sufficient advertising will take the form of notices posted throughout campus, as well as an invitation via e-mail to every member. The positions of Chair, Vice-Chair, Treasurer, and Community Liaison, herein referred to as the Executive, will be chosen at the Annual General Meeting for one (1) year terms of office. The Chair, the Treasurer, and one other club member will be the designated signing officers of the club. The Executive will meet a minimum of six (6) times per year. Executive Meetings must take place in each of the following months: September, October, November, January, February, and March. Executive Meetings are open to all club members, and a minimum of three (3) Executive members must be present to establish quorum. In the event of a mid-term executive vacancy, a special general meeting will be called to elect a new executive member. In the event that there are no current executives, the Director of Student Affairs will be empowered to appoint an interim executive so that a special general meeting may be called. The Chair will be responsible for the overall operations of the club. S/he will ensure that both the Executive and the general Membership meet on a regular basis throughout the academic year, and the Purpose of the club is realized. S/he will act as the principal liaison with the UVSS Clubs Council and Director of Student Affairs. The Vice-Chair will assist the Chair in the exercise of her/his duties and take responsibility for these duties if the Chair is incapacitated or otherwise unable to perform these duties. The Community Liaison will oversee the club’s communications and relations with the Turning the Tide community-based Organizing Committee as well as other organizations in the Greater Victoria and Salish Sea area. All banking will be carried out subject to the rules and regulations of the Students’ Society as set out by the Board of Directors. The allocated budget grant that the Turning the Tide UVic Club receives each year from the Clubs Council will be deposited into the club’s standard budget account at the General Office of the Student Union Building. Any funds remaining in the Turning the Tide UVic Club’s budget account after the conclusion of the fiscal year (April 30) will revert to the Clubs Council control account. All funds designated as self-generated must be deposited in the Turning the Tide UVic Club’s trust account at the General Office. Cheque requisitions must be submitted according to UVSS policy to obtain access to these funds, and are subject to approval by the Director of Services. The Constitution and Bylaws of the Turning the Tide UVic Club may be amended on written published notice of at least one week prior to a General Meeting. Amendments require a two-thirds (2/3) majority vote at a quorate General Meeting. In order to reach Quorum for constitutional amendments, at least fifty (50) percent of the active membership of the club must be present. Nothing in this constitution will be interpreted in a manner repugnant to the Constitution and Bylaws of the University of Victoria Students’ Society or to the declared policy of the Students’ Society Board of Directors.